Central Railway Recruitment Notification 2019.Central Railway has released a notification for the recruitment of Retired Staff vacancies.Check the eligiblity and notification prior to apply for the positions. 1. 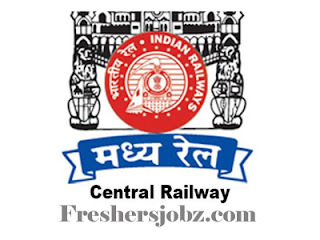 Category: Station Master, Junior Engineer (Sig), Junior Engineer (Tele), Helper, Ch.Office Superitendent, Senior Clerk, Senior Section Engineer, Welder, Tuuner, Painter, Crane OPT I, Crane OPT III, Tech I. 2. Retired staff who have retired from Mumbai Division of Cenrtral Railway and from the same category and same department for which notification is issued can apply. The employees Removed / Dismissed/ Compulsory retired as a result of disciplinary action or in review, are not eligible for re-engagement. Further employees retired under SRRS/LARSGESS will not be eligible. 3. The re-engaged employees are entitled only for monthly fixed remuneration i.e reducing pension from his/her last pay drawn, (i.e. Basic+DA) at the time of retirement. The monthly fixed remuneration plus full pension shall not exceed the last pay drawn at the time of retirement. 4. The retired employee shall execute an agreement to abide by all the terms and conditions of the re-engagement. The retired employee shall execute an agreement to abide by all the terms and conditions of the re-engagement .Suitability / Competency of the applicant shall be adjudged by nominated committee before their re-engagement. Age: Maximum upper age limit for re-engagement on 01.12.2019 is 65 years. No re-engaged employee should continue in service beyond 65 years of age. 1. Copy of any of the following documents should be attached with the application & it is Mandatory. The last date for submission of the application is 18.02.19. Staff retired from Mumbai Division Central Railway desirous for re-engagement , have to submit their applications in the prescribed format at Annexure A in the box kept in P/General Section of this office on or before 18.02.19.